Beautiful dishes and plates can be as decorative as they are functional and cost significantly more when new. How are sweaters decorative? 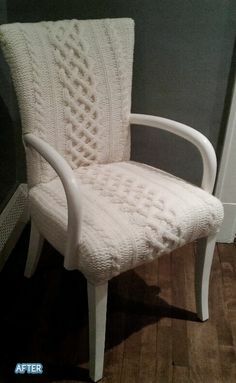 You can use them to re-upholster your chairs! Check it out. Don’t worry if your chosen thrift store lamp doesn’t work. It’s not difficult to rewire it. Plates can be used for a variety of crafts, like making mirrors. You can also display painted ones or just use them for a dining set. Get unique and inexpensive Christmas decorations at thrift stores. Use them for storage or make them into trendy tables. Awesome rocking chairs can be hidden behind old or broken rockers. Here’s how to restore them. Share these ideas, and this page, with your friends for more thrift store fun!